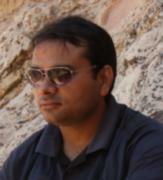 Deepak K. Pandey has 345 links managed on Repio. This is my LinkedIn page that contains useful information about my education, employment and skills. This is a presentation about Kevin G. Hall Nano-metrology Lab (my work place during my PhD) at Birck Nanotechnology Center at Purdue University. This presentation was delivered by my PhD advisor Prof. Ronald G. Reifenberger. This presentation talks about details of speciality laboratories for high precision scientific measurements. This work was done in collaboration with a group of scientist at Sandia National Laboratory. In this work, I was studying chemical, structural and electronics properties of diazonimum molecules chemically attached to hydrogen passivated Silicon surface. Keving G. Hall Nano-metrology room was my working laboratory during my PhD and is high precision atomic scale measurement laboratory. This laboratory houses a home build Ultra High Vacuum Scanning Tunneling Microscooe/Scanning Force Microscope [UHV (STM/AFM)]. The purpose of Kevin G. Hall Nano-metrology room is to provide high-quality space that can be utilized on a daily basis to facilitate experiments requiring nanoscale precision, to develop new instrumentation, and to develop new techniques capable of probing the nanoscale.This study describes the characterization and performance of the Kevin G. Hall Nanometrology Laboratory. This is the publication list at Birck Nanotechnology Center at Purdue University. Few of my publications are listed at this page. This page contains some of my publications listed at the website of Birck Nanotechnology Center, Purdue University. This is a conference proceeding published in ECS Transactions, 19 (5) 75-80 (2009), The Electrochemical Society. In this study we report surface microscopy characterizations of large size graphene films (up to mm) grown on polycrystalline Ni foils and transferred to Si/SiO2. Wrinkles in such films are studied by both atomic force microscopy (AFM) and scanning tunneling microscopy (STM). Local graphitic lattice structures of the films are imaged with atomic-resolution STM and compared with those of the highly ordered pyrolytic graphite (HOPG). I worked with a group of scientists from Purdue University, University of Houston and Brookhaven National Laboratory to study single-crystal graphene grains synthesized by ambient chemical vapour deposition on polycrystalline Cu. This study shows how individual boundaries between coalescing grains affect graphene?s electronic properties. The graphene grains show no definite epitaxial relationship with the Cu substrate, and can cross Cu grain boundaries. The edges of these grains are found to be predominantly parallel to zigzag directions. Study also shows that grain boundaries give a significant Raman ?D? peak, impede electrical transport, and induce prominent weak localization indicative of intervalley scattering in graphene. Finally, this study demonstrate an approach using pre-patterned growth seeds to control graphene nucleation, opening a route towards scalable fabrication of single-crystal graphene devices without grain boundaries. This paper was published in JOURNAL OF APPLIED PHYSICS in 2010. This paper presents a comprehensive study of the structural and electronic properties of ultrathin films containing graphene layers synthesized by chemical vapor deposition based surface segregation on polycrystalline Ni foils then transferred onto insulating SiO2 /Si substrates. This article was published in Inside Purdue issue of April 29, 2010. I was presented with Graduate Teacher Certification that is achieved only by ~ 5% of graduate students from a pool of ~1000 students. This work was performed by me during my PhD at Birck Nanotechnology Center at Purdue University. I presented this work in 2008 APS March meeting in front of ~50 audiences ranging from graduate students, professors and company professionals. This work was presented by Prof. Yong P. Chen of Purdue University. This is a conference proceeding published in The Minerals, Metals & Materials Society (TMS). TMS is a rare professional organization that encompasses the entire range of materials and engineering, from minerals processing and primary metals production to basic research and the advanced applications of materials. The topic of the publication is “Material and Electronic Properties of CVD Graphene Grown on Ni and Cu then Transferred to Insulators”. I was affiliated with Department of Physics at Purdue University during my PhD. During this period I taught variety of physics courses ranging from mechanics, thermal, optics and electro magnetism. During my time at Physics I coordinated lab courses, recitation and lectures. Kevin G. Hall nanometrology room was my work place during my PhD. This is a video tutorial of Kevin G. Hall laboratory at Birck Nanotechnology Center, Purdue University. The tour highlights the design, performance and characterization of this high accuracy room for nanoscience research. Key features of the room including electrical power, vibration isolation, thermal stability, acoustic isolation, and EMI shielding are shown. I presented this talk at Center for Nano-materials Design and Assembly (CNDA) at Michigan State University. I spoke about chemical, structural and electronic properties of hybrid silicon-organomolecular materials and graphene oxide.